ExpressoMobi: This channel is dedicated to the best of Expresso. Here you'll find actors, musicians, dancers and entertainers strutting their stuff on Expresso. If your a fan of the South African highlife, interesting people and the funniest moments on Expresso, than this is the place to be. ExpressoRecipes: Tasty meals made from premium quality foods by the likes of Franck Dangereux and Michael Oliver are a daily experience on Expresso. Given the popularity of our PnP Recipes, this channel is dedicated to our daily dish. Bon apetite! ExpressoFitness: We've all done it. You set a new year's resolution to lose weight and stay in shape yet lo and behold, it's the 14th of January and your fitness goals are well and truly dead. But now that Expresso Fitness is here you've got no excuse. Join in on the daily exercise routines or learn from the professional athletes like Pierre Spies. There is no time better than now to get rid of that Belly! ExpressoHealth: Here on Expresso we like to look after our viewers, providing expert insight into the world of health and well being. With Vital Health and Dettol on board, we take a look at the latest health trends, how to look after your body, and those illnesses and diseases that can be avoided through good health and hygiene practices. 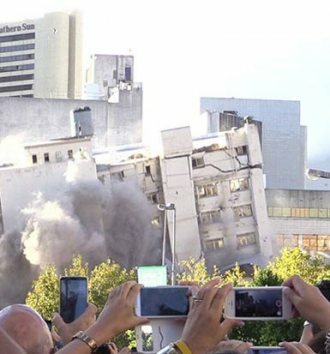 Cape Town said goodbye to the Tulip Hotel on Sunday morning in a mammoth implosion that saw the 12 storey building go down like a house of cards in seconds!